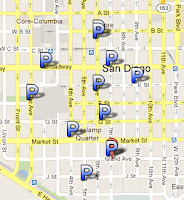 I've just published a publicly-editable Google Map of San Diego motorcycle parking spots that I've found. I was recreating the map in my head each time I went downtown .. with a couple spots committed to memory just because I knew they were near a good restaurant. So, I made a real map. Enjoy! Thank you for sharing this! So great.